No Freight & No set up. Financing As Low As 4.99% - Apply Here! IN STOCK. No Freight and no set up fees. Finance rates as low as 4.99%. THE BEAST is not about mincing words or pulling punches. Blunt, brutal and extreme - there is nothing tame about this hyper-naked bike. With an updated design, mega powerful 1301 cc V-twin engine and exceptional all-round handling, the KTM 1290 SUPER DUKE R commands respect. 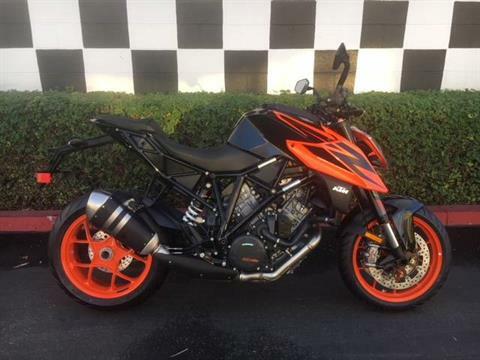 BODYWORK & GRAPHICS: Fresh decals, a sharp rear end, aggressive tank spoilers and air intakes, portrays the KTM 1290 SUPER DUKE R’s brutal attitude. The reduction of plastic parts shouts 'NAKED' and creates a BEAST that is always READY TO RACE. TFT COLOR DISPLAY: Just like fighter pilots need information available to them at a moment’s notice, so do KTM 1290 SUPER DUKE R riders. The TFT display fitted to the SUPER DUKE R gives riders all the information they want at a moment’s glance. This means less time looking down, and more time looking ahead. LED HEADLIGHT: There is no chance of mistaking the KTM 1290 SUPER DUKE R for anything else in the parking lot. An aggressive headlight mask houses powerful LEDs, while 6 additional LEDs make up a halo of daytime running lights. This means extra safety and additional visibility on the road. SHARP REAR END: Slim, short and aggressive, the KTM 1290 SUPER DUKE R flaunts a sharp tail end which compliments the overall silhouette. Regardless if fitted with the removable pillion seat, or single seat cowl, THE BEAST is always ready to shred. MENU SWITCH: Different modes for the various assistance systems can be selected using an illuminated menu switch on the left side of the handlebar. It's very simple and intuitive: "up" and "down" through the menu selection, select the desired menu item with the right button, confirm it with the right. The cruise control switch is now mounted on the left hand side in this cluster, right within thumb’s reach. CHASSIS: Ultimate power requires total control. With its ultra-lightweight yet extremely stable trellis frame, a beautifully manufactured single-sided swing arm, high-end BREMBO brakes and state-of-the-art WP suspension components, the KTM 1290 SUPER DUKE R is the poster-boy for hooliganism. Paired with 17-inch tubeless wheels front and rear, and wrapped in METZELER M7RR tyres, THE BEAST tears into tarmac for maximum grip. 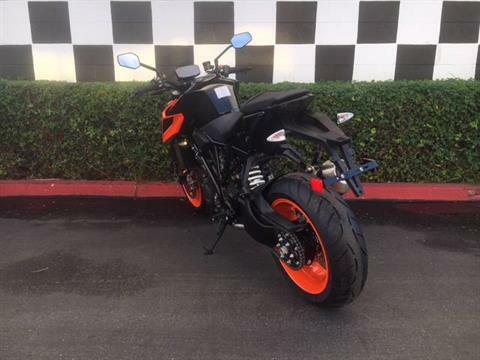 FRAME: With its ultra-lightweight yet extremely stable trellis frame, a beautifully manufactured single-sided swingarm, the KTM 1290 SUPER DUKE R exceeds all requirements for stability and control. SWINGARM: The jaw-droppingly beautiful, light alloy, single-sided swingarm on the KTM 1290 SUPER DUKE R is not only extremely lightweight, but also precision engineered and generously dimensioned – a potent partner when the SUPER DUKE R unleashes its torque and riding dynamics. The design of the swing arm is adapted optimally to the tubular trellis frame in terms of flex and stiffness. ENGINE & EXHAUST: Launching THE BEAST forward at warp speed is a lightweight V-twin engine that is the most potent powerplant in its class. Weighing in at just 62 kg, it blasts out 132 kW (177 hp) and delivers its maximum 141 Nm of torque between 6750 rpm and 7000 rpm. No doubt then that it packs a fearsome punch for full-paced race attacks. Whether for street or racetrack use, it lays down bucket loads of pure, unadulterated performance. ENGINE: State-of-the-art, machined titanium inlet valves with chromium nitride PVD coating – how impressive does that sound? These feature a flat design, and weigh 19 grams less than steel inlet valves. 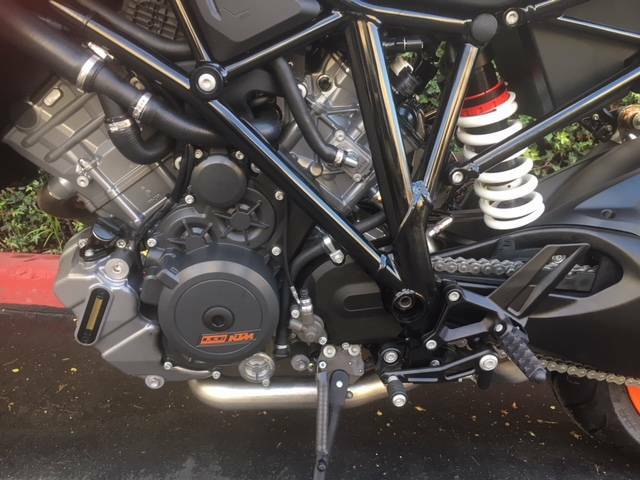 When combined with the smaller combustion chamber on the KTM 1290 SUPER DUKE R, offer a compression ratio of 13.6:1, and ultimately, more power. TITANIUM INLET VALVES: State-of-the-art, machined titanium inlet valves with chromium nitride PVD coating – how impressive does that sound? These feature a flat design, and weigh 19 grams less than steel inlet valves. When combined with the smaller combustion chamber on the KTM 1290 SUPER DUKE R, offer a compression ratio of 13.6:1, and ultimately, more power. CYLINDER HEADS: Thanks to the resonator chambers on the cylinder heads, which have been engineered to increase the torque output in the lower to mid-range rpms, the KTM 1290 SUPER DUKE R power train runs smoother, consumes less fuel and cuts down on CO² emissions by around 10%. SLIPPER CLUTCH: Keeping the rear-end in check under harsh downshifts or aggressive decelerating by reducing rear wheel chatter, the slipper clutch also assists when you open up the throttle by assisting the Quickshifter+ to perform super smooth up-shifts. RIDE-BY-WIRE: The Ride-by-Wire on the KTM 1290 SUPER DUKE R goes the extra mile. It electronically translates the throttle commands of the rider into the best throttle valve positions for the current riding situation. Choking, jolting and involuntary wheelies are a thing of the past. Voluntary ones, however, could easily be a thing of your future. CRANKSHAFT: The free-revving nature of the KTM 1290 SUPER DUKE R’s V-twin further enhanced by a very low reciprocating weight of its crankshaft. Moreover, the flow-optimized shape of the crank makes for smoother power delivery and for motor stability. 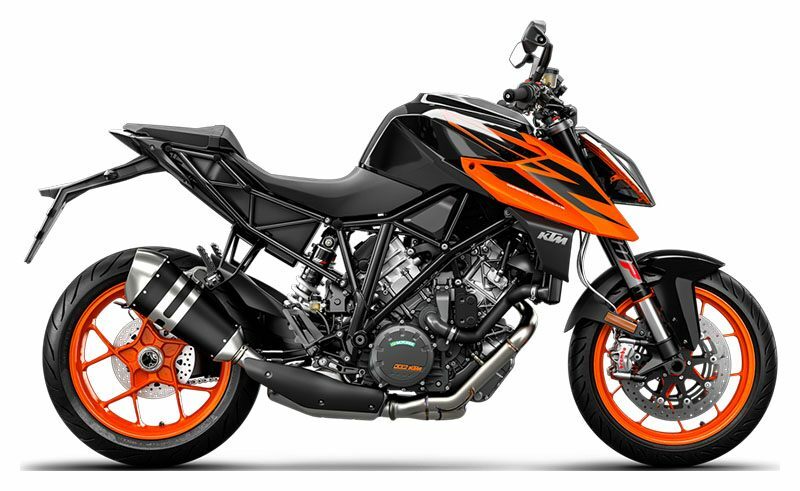 PISTONS: Arguably the most important part of the motor, the forged piston structure on the KTM 1290 SUPER DUKE R has been borrowed from Formula 1 technology. This results in a high loading capacity, despite the extremely short and lightweight design. Furthermore, the piston skirts have a state-of-the-art, hard-anodized finish to minimize friction, and maximize longevity. INTAKE FLANGE: An intake flange is more than just a bit of plumbing that connects the throttle body to the ports in the cylinder head. It is an integral part of the induction system and has to match the airflow characteristics of the cylinder head and camshaft, as well as the displacement and rpm range of the engine, in this instance, widening its powerband by 500 rpm. Thunder along and surf its torque or whip it hard and meet THE BEAST. 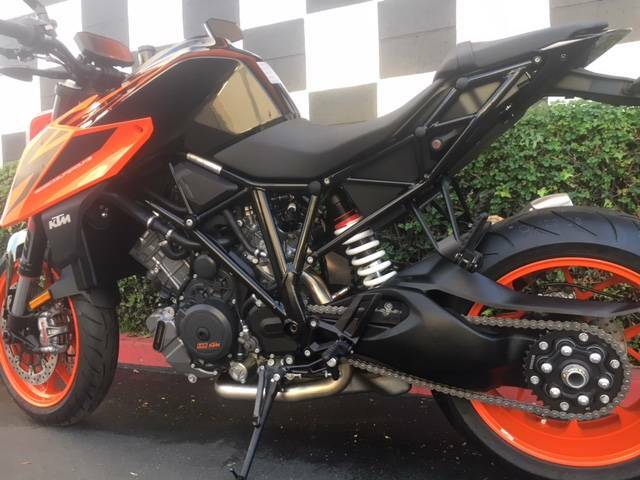 TWIN IGNITION: The KTM 1290 SUPER DUKE R features a twin-plug ignition system, which controls two differently sized spark plugs in each cylinder head independently of each other. This adds to the overall efficiency of the motor. The result? More power, better feedback, lower fuel consumption and lower emissions. 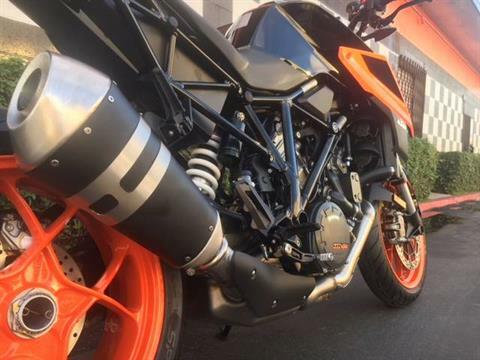 EXHAUST: The KTM 1290 SUPER DUKE R’s exhaust system is made entirely from rustproof stainless steel and is Euro 4 homologated. 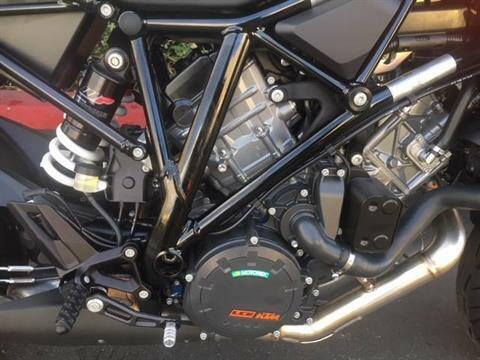 Hundreds of test bench runs and complex simulation, ensured that the exhaust system contributes to the extremely smooth torque curve and excellent emission values on the V-twin. And did we mention the sound? While it whispers at low revs, it will take your breath away reaching for the high notes. ERGONOMICS & COMFORT: The powerful yet sophisticated engine in the KTM 1290 SUPER DUKE R enables hyper-sport propulsion or, when required, relaxed and comfortable riding – and everything in between. 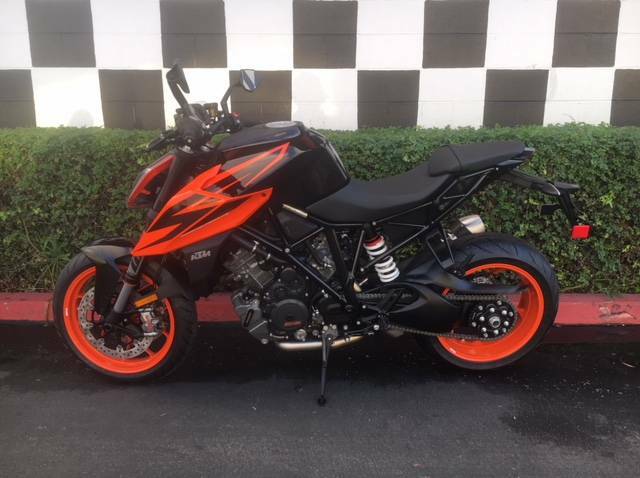 Pair that with fantastic suspension, geometry and rider aids, and the SUPER DUKE allows for unimaginable riding pleasure in all conditions at whatever speed you want, from very relaxed to very, very fast. 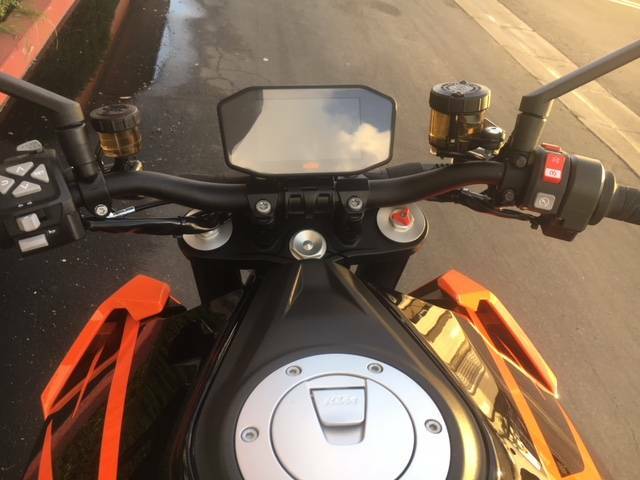 MENU SWITCH: In order to access the multitude of assistance systems on the KTM 1290 SUPER DUKE R, there is an illuminated menu switch on the left side of the handlebar. It features a very simple and intuitive "up" and "down" menu selection. The Cruise Control switch can also be found on the left-hand cluster. 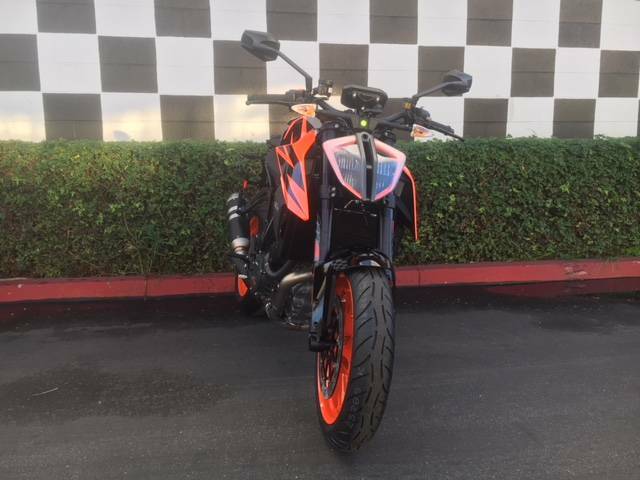 SOFTWARE & ELECTRONICS: Unrivaled braking from world market leader BREMBO, and assistance system MTC (Motorcycle Traction Control) and lean-angle sensitive ABS developed in close collaboration with BOSCH, round off the package and help the KTM 1290 SUPER DUKE R lead from start to finish. They allow you to either unleash the full potential of THE BEAST or to reign in its fury to easily and instantly adapt to changing riding conditions and personal needs, with the simple flick of a switch. MSC (MOTORCYCLE STABILITY CONTROL) WITH CORNERING ABS: Taming THE BEAST is a state-of-the-art 9.1 MP modulator, which unites the talents of efficient braking and pressure modulation with the high quality of BREMBO. This means bringing a rampaging KTM 1290 SUPER DUKE R to a controlled stop is as easy as putting one finger on the level. SUPERMOTO MODE: Who doesn’t like the odd drift? The KTM 1290 SUPER DUKE R is no different. By selecting Supermoto Mode, riders can disable ABS on the rear wheel and leave their mark everywhere! RIDE MODE TECHNOLOGY: The rider has a choice of three ride modes on the KTM 1290 SUPER DUKE R, which can be selected quickly with the menu switch on the handlebar. In conjunction with ride by wire, the selected ride mode influences the general responsiveness of the engine, its maximum peak power and MTC intervention. "Street" and "Sport" modes deliver a full 177 hp and appropriately potent power development with a sporty traction setting. By contrast, "Rain" mode limits the maximum output to 130 hp with smoother performance and early traction control intervention. MTC (MOTORCYCLE TRACTION CONTROL): Motorcycle Traction Control or MTC, is a lean-angle sensitive traction control system. This takes the contact patch of tires into account, and auto adjusts its interference accordingly. Depending on the selected ride mode, MTC allows three different levels of traction slip at the rear wheel. Of course, it can be entirely disabled to unleash THE BEAST. KTM RACE ON SYSTEM: Forget about ignition keys and mechanically locked fuel caps, the KTM 1290 SUPER DUKE R features KTM RACE ON! All you need is the transponder key in your pocket and you can unlock THE BEAST. CRUISE CONTROL: Long motorway journeys are easily dispatched with the SUPER DUKE R’s cruise control system. Easily activated and controlled by a switch on the left hand side of the handlebar, riders can set cruise control in 3rd, 4th, 5th and 6th gear, between 40 km/h and 200 km/h. That’s one way to save energy for the twisty bits. TPMS (TIRE PRESSURE MONITORING SYSTEM): As its name implies, the TPMS monitors tire pressure and warns riders of potential tire damage in the event of pressure loss on the TFT display. An added convenience when you want to spend more time on the road and less time checking air pressures. ATIR (AUTOMATIC TURN INDICATOR RESET): Auto-cancelling turn signals are a big improvement in terms of safety, as it is now impossible to for forget that they are activated and flashing into infinitum. Indicators stop flashing after 10 seconds and in 150 meters. KTM MY RIDE: A smartphone can be tethered wirelessly to the KTM 1290 SUPER DUKE R’s TFT display, giving you full control over your audio player and incoming calls. All relevant cellular information gets displayed on the dash, allowing you to interact via the bar-mounted menu switch, keeping your hands where they belong.